St. Philip’s is so tiny. Is it a real church? Yes, it is. St. Philip’s celebrates two masses every Sunday (8:15 a.m. and 10:15 a.m.) year-round, as well as numerous special masses throughout the liturgical calendar. On Wednesdays, the church is open for morning prayer (9 a.m.), evening prayer (6:30 p.m.) and quiet Eucharist (7 p.m.). In addition, the church frequently opens its doors for readings, concerts, speakers and other events of spiritual, artistic or cultural interest. St. Philip’s hosts three separate AA meetings within its walls. Our church garden is a place of rest and prayer for locals and visitors alike. Many couples choose to be married at St. Philip’s, attracted by its simplicity, history and charm. And we are proud to host other faith communities on a regular or occasional basis. We believe our small footprint is an advantage. It helps keep our overhead low, allowing us to focus our efforts, energies and resources outward, where they are most needed. What does is mean to be an Episcopal church? St. Philip’s is part of the Episcopal Diocese of Pennsylvania, a community of 138 congregations headquartered in Philadelphia, which in turn is part of the Episcopal Church, one of 38 autonomous churches in the worldwide Anglican Communion. We are a diverse church body, with important commonalities. Around One Table, with its multiple resources, is a good introduction to the Episcopal identity and mission. You may also want to connect with the church’s online Visitors’ Center or with Explore the Episcopal Church on the Episcopal Café website. As Episcopalians, what do you believe? There’s a saying that’s often used to describe the Episcopal church’s approach to faith: As we pray, so we believe. Our prayer together shapes our beliefs and is the foundation of our common life as a church community. It’s drawn from the Book of Common Prayer, which contains a short outline of our beliefs in the Baptismal Covenant. For us as Episcopalians, though, faith isn’t primarily a list of things people have to believe. It’s a way of life that is worked out through our relationships with God and with each other. That begins as we pray together, and continues as we work together in service to our brothers and sisters – even as we gather simply to enjoy one another’s company. The best way to experience this is to come pray with us. We welcome newcomers, including those who have been afraid, for one reason or another, that they wouldn’t be welcome in church. What’s a service at St. Philip’s like? Joyful. Prayerful. Warm. There’s a lot of talking and laughter before things get underway. Whether it’s a normal Sunday with 35 or 40 people at each of the two masses, or a special mass bursting at the seams, worship at St. Philip’s has an intimacy and immediacy that is anything but institutional. On Sundays, the 8:15 a.m. service is quiet and contemplative, with no music or singing. The 10:15 a.m. service attracts people who enjoy a more exuberant expression of their faith. Members of our choir come a few minutes beforehand to practice hymns for that day. Between the two services, beginning at 9:15 a.m., there may be an adult forum discussion or a special speaker. Recent adult forum topics have included Franciscan spirituality, caring for oneself while caring for loved ones, and Pope Francis’s 2015 encyclical on the environment, Laudato Si: On Care for Our Common Home. It’s challenging to describe the personality of our community as a whole, but we embrace a fairly open theology and the diversity of all God’s people. 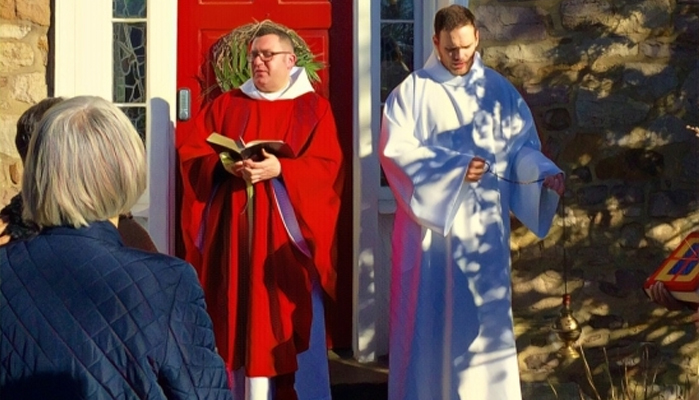 Parish life at St. Philip’s is characterized by the inclusive and joyful interaction of a small, tightly knit congregation with a deep connectedness to one another and to God. Our declaration that everyone is welcome is more than empty words. These are our marching orders as followers of Jesus Christ, who commanded us to love one another and forbade us to stand in judgment, ever. What does fellowship at St. Philip’s look like? Adult Forum — Meeting at 9:15 a.m. between Sunday services, our Adult Forum is a moderated discussion that explores the subjects that matter to us as people of faith. Recent topics have included a discussion of Prayer in the Cave of the Heart and the contemplative life; death and dying; caring for loved ones; Laudato Si, Pope Francis's encyclical on the environment; and Franciscan spirituality. Dinner Church — Started in 2014, Dinner Church has become a popular way for the people of St. Philip’s to meet and talk over a good meal and a glass of wine. The discussion can go anywhere — and is always interesting! Recent dinners have been held at Caleb’s, The Café Blue Moose, Perfect Taste, Manon, and at parishioners’ homes. Service events — There’s nothing like working side by side with people to get to know them. Our meal-packing event on a recent Martin Luther King Day was a perfect case in point. Organized into seven production lines of about 10 people each, participants laughed, swapped stories and exchanged high fives as they worked to pack 27,000 nutritious meals for food-insecure people in our region. Check our Weekly Bulletin for upcoming service events — and join us! What community activities does the church participate in? Service is an important part of our commitment to be “boldly incarnational” in the world. Learn more about our service activities. Our rector is The Very Reverend Michael R. Ruk — or simply “Michael,” as he prefers to be called. Learn more about our priest. What’s the history of St. Philip’s? Our church building was constructed circa 1810 as a one-room schoolhouse. It was purchased by the Diocese in 1921 and became a self-supporting church in 1954. Learn more about the history of St. Philip’s. Why don’t you have a Sunday school? Are children welcome? St. Philip’s currently has no Sunday school because we don’t need one. Our parishioners are mostly adults, and the children who attend simply sit with their families. But children are very welcome at St. Philip’s! It’s often said that parishes can’t grow unless they attract families with young children. That’s probably true in many places. At St. Philip’s, growth has largely been the result of adding new adult members. Should that change, we’ll shift our resources to reflect the new needs of our community. Can I get married or baptize my child at St. Philip’s, even though I’m not a member? Yes, you can! Of course, we always hope that people who make the important decision to marry or baptize their children at St. Philip’s will continue to participate in the life of our church. Learn more about weddings and other life celebrations at St. Philip’s. Why do you have a sculpture by your front door? As part of the PNC Arts Alive Outdoor Sculpture Project, in partnership with New Hope Arts, St. Philip’s is hosting a marble sculpture called “Common House.” Learn more about Common House. Why do you have a labyrinth on your front lawn? Churches have been home to labyrinths since medieval times. One of the most famous labyrinths – at Chartres Cathedral in France — dates from the 13th century. Learn more about the St. Philip’s Labyrinth.